Kcymaerxthaere (née Kymaerica, pronounced `ky-MAR-ex-theere`) is an alternate world. It exists over and above our own in a system of 29 `gwomes`, only 4 of which are actually Kymaerica (an early name for the world). It was discovered by Geographer-At-Large Eames Demetrios, who goes around the real world setting up real plaques in real places commemorating events that occurred in this alternate world. It`s a globe-spanning work of intricate complexity. There are histories behind histories. Dip into his site at Kcymaerxthaere.com and you`ll immediately be overwhelmed by a plethora of gwomes, cognates, and words beginning with silent k`s and a`s. Delve a little deeper and you`ll be washed over with the rich history of the Parisian diaspora, the religious formation of the Jihn Wranglikan sect in aArizona, and the construction of the Eqlmundi Kirwela . 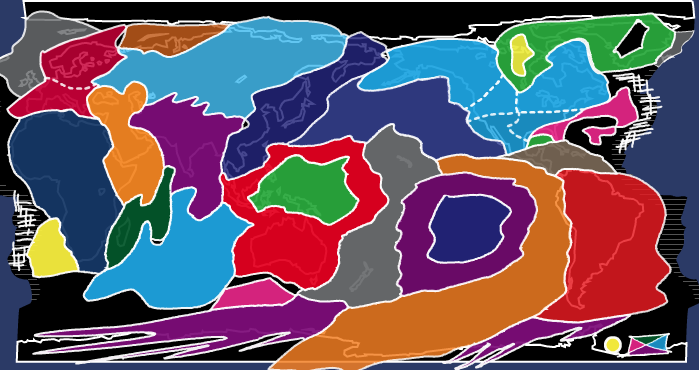 The gwomes of Kcymaerxthaere overlaid over our world map. The site bills itself as a global work of three-dimensional storytelling, and encourages us to go to the plaque sites for ourselves, look over the alternate histories on display, and really get a feel for the possibility of it all. I get that. I think it`s kind of a genius project, not unlike other one man works of grand art like the Dreamer`s Gate or the hotel carved into a rock-face. I love this kind of vision, transformed into reality. 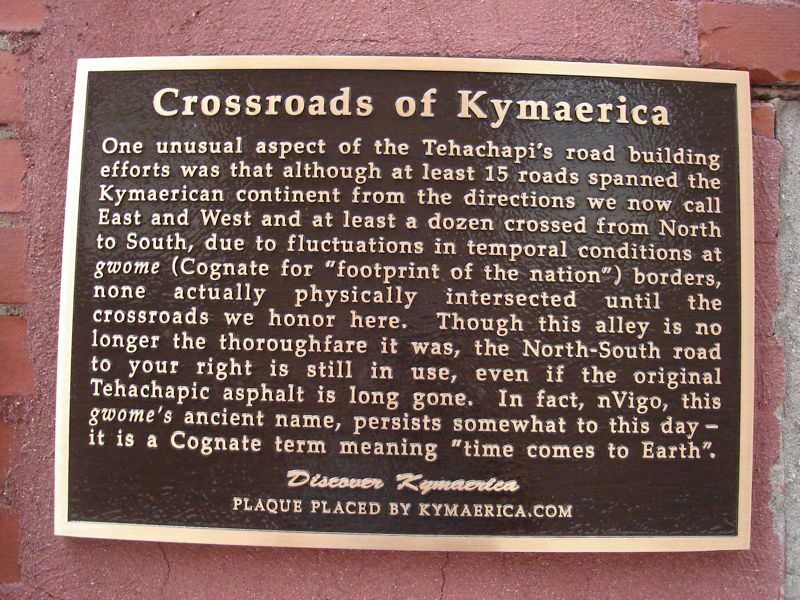 It kind of makes me wish the Geographer-At-Large was placing more than just plaques, that he was laying out statues, buildings, getting roads renamed, anything to subvert reality and bring Kcymaerxthaere through into our universe. It adds color, if nothing else. It`s also great exercise for the brain. If he did though, then I guess what was a cute project would become something more like a cult. There`d be people who really came to believe this stuff, like in Mormonism or Scientology, both of which were made up fairly recently. Then it might be creepy, and he`d have too much money and influence. As it is though, tongue-in-cheek, creative, wacky, interactive, I`m a big fan. If he had fiction books, not just `travel guides` but actual stories, I think I`d go out and buy some. 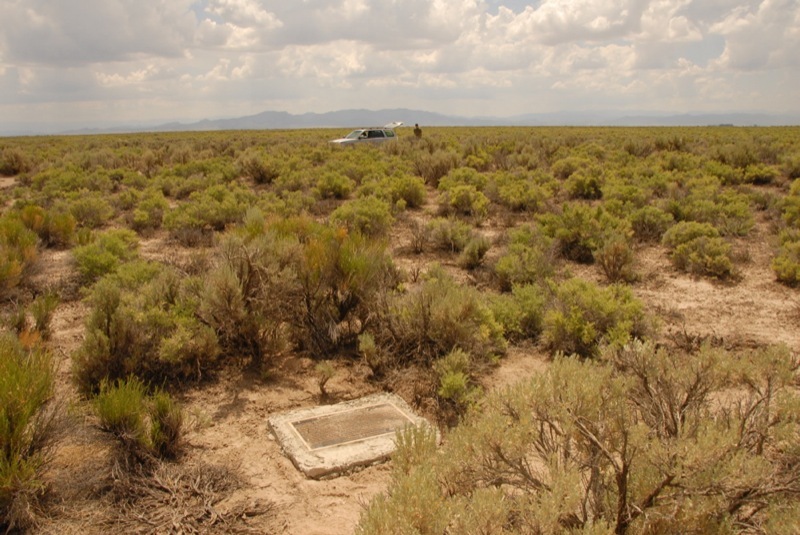 A plaque in the desert. Is it just me or isn’t it a bit ridiculous, and maybe even unwise, to be going around making up stories and then placing permanent “historical” markers all over the planet for these stories? So…why do you think it’s “unwise” to place these plaques? If a person can’t see that these are not REAL historical plaques…then they need to re-read their history books. I found one, here, in the west Texas town where I live. It only took me SECONDS, to see it wasn’t real. Indians, brewing soda, made with natural gas?…that Bonnie and Clyde drank?? This tiny town, has a lot of history…the oil boom, Amelia Earhart landed here in 1938, birthplace of Ted Neely (of Jesus Christ Superstar fame) but, indians…bottling soda, never happened. It’s art…pitty, you don’t get it. Maybe you don’t get it, but I think what Kirra said has to do with the future…obviously nobody would think that they’re real NOW, but what if in four centuries from now someone would find such thing…that would cause problems…. 1931…I mis-typed. Amelia Earhart, landed here in 1931…carry on. I located one in New Mexico, near Demming. I believe it is amazing that someone created this and then had the resources to desire leave behind a permanent marker. It is all a creation of one persons mind and if anyone thinks it’s real they could become a candidate for President or a TV evangeliist. I located one in New Mexico, near Deming. I believe it is amazing that someone created this and then had the resources and the desire leave behind a permanent marker. It is all a creation of one persons mind and if anyone thinks it’s real they could become a candidate for President or a TV evangelist. I located one in New Mexico, near Deming. I believe it is amazing that someone created this and then had the resources to desire leave behind a permanent marker. It is all a creation of one persons mind and if anyone thinks it’s real they could become a candidate for President or a TV evangeiist.